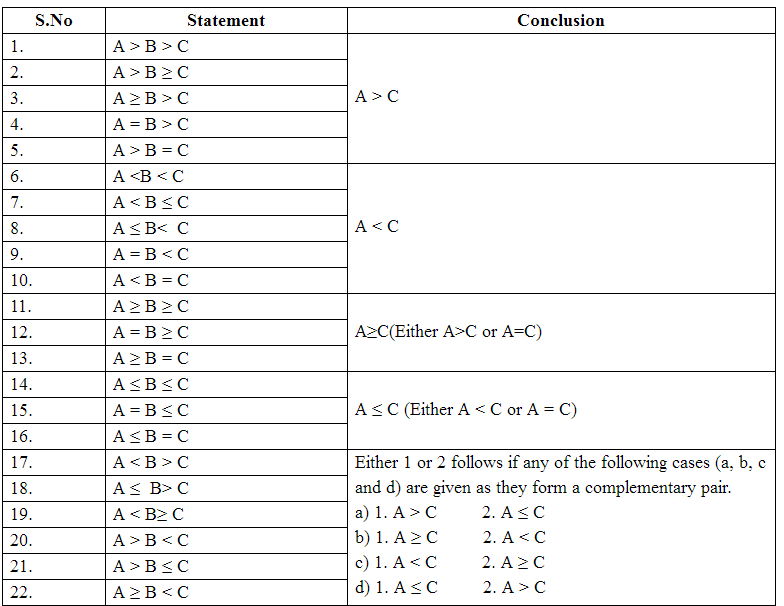 In these questions, you will be provided with a statement consisting of a group of elements. These elements will be having a certain coded relationship among them which is denoted by different inequality symbols, “=, >, <, ≥, ≤”. You should know the meaning of different symbols which will help you in finding the relationship between the different elements of a statement. For the sake of convenience, the relationship between certain statements and their meaning is given below in a tabular form. Now we are clear about the meaning of different symbols. Check the below table for the relationship gives Conclusion for Statements. a) Direct Inequality in which direct symbols will be given in the statement. b) Coded Inequality in which coded symbols (like @, %, $ etc) will be given and they signify will be provided separately. Both kinds of questions can be solved easily once you have gone through the above tables. Rule 1: The combination between two inequalities can be established, if they have a common term. Rule 2: The combination between two inequalities cannot be established, if they don’t have a common term. Rule 3: The combination between two inequalities can be established, if and only if the common term is greater than (or ‘greater than or equal to’) one and less than (or ‘less than or equal to’) the other. Rule 4: Complementary Pairs: (Either & or) – Either and or cases only takes place in complementary pairs. We cannot combine two elements with common elements in which no relation is established. 'P©Q' means 'P' is greater than 'Q'. 'P%Q' means 'P' is smaller than 'Q'. 'P@Q' means 'P' is either greater than or equal 'Q'. 'P$Q' means 'P' is either smaller than or equal to 'Q'. 'P#Q' means 'P' is equal to 'Q'. A) If only conclusion I is true. B) If only conclusion II is true. C) If either conclusion I or II is true. D) If neither conclusion I nor II is true. K ≥ B = J >T, K > T. Hence, Conclusion I is not true. B >T. So, conclusion II is not true. F ≤M ≥ L = W, M ≥ W. By conversion W ≤ M. Hence, conclusion I is true. We can't compare F and L. Hence, conclusion II is not true. R = Q ≥ F < A We can't compare R and A. Hence, conclusion I is not true. R ≥ F. Hence, conclusion II is not true. (D) M ≥ R>F=L. So, R>L. Hence, conclusion I is not true. Even, the Conclusion II is not true. (C) T < J ≥ V= W Either I or II follows. (A) R ≤ M < H ≤ F. Hence, R< F. Conclusion I is true. As M< F conclusion II is not true. a) If only conclusion I follows. b) If only conclusion II follows. c) If either conclusion I or II follows. d) If neither conclusion I nor II follows. e) If both conclusions I and II follow. Solution: In conclusion I relation is asked between G and E. So, we will try to find relation between it and we can see that G and E are in different statements. So, first we will identify the element which is common in both statements given i.e. C.
In conclusion II, relation is asked between A and H, C is also between two statements. A > B ≤ C ≥ F = G > H. In this, C > H but relation between A and C cannot be defined as relation is changed at B. So, Conclusion II does not follow. How to approach this in Exam without taking more time? You should check that inequality sign should follow in same direction like in statement 1 from C to E signs are in same direction and In statement 2 from G to C are also following in same direction. But in case of A and H, direction of sign between A and C changes at B. It discontinued the relation between A and C, from C to H relation are in same direction. So conclusion does not follows. Solution: In statements, T element is common. For relation between S and V, sign changes at T itself. So this does not follow. So, it also does not follow. For H to L, relation is discontinued at K. So it does not follow. Solution: There are three statements in statement 1 and 2 P is common, statement 1 and 3 K is common. We can see that, directions of signs are changed at P.
So it does not follow. Conclusion II: Now, we have to connect all three statements. In this also direction of sign changes at K.
Solution: In statement 1 and 2, element H is common. Hence E ≥ N follows.